- Q : Krishna, what about Lee Lozowick ? 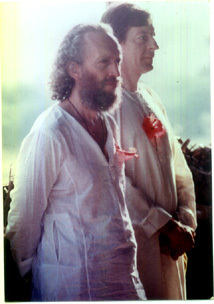 Lee Lozowick is an American spiritual teacher. He is a devotee, let us say a disciple of Yogi Ramsuratkumar. Some time ago, some hard words from this stupid Krishna could be read on this WEB site concerning Lee (1). This was some 'organic reaction', the same as, when the body knows some indigestion, it has to vomit. This also was a way to ask Lee to stop the game he was playing since so long. Now, let us remove some of these words, they have become useless and unimportant. Since long I hoped that Lee and i could have links to work for the same goal, as Yogiji wanted. Since these words were put on the Internet, i came to India (Nov.-Dec. 2007), here and there, and particularly to Tiruvannamalai, and heard things i did not know. From them, i could understand better this surprising behavior. Surprising because this behavior didn't appear in one day. In 1994, the relation between Lee and me was really fine, really good. Even in March 1995, Lee sent me two pictures, one together with our Father, the second one with he and i. And it is like this that this Krishna would want us to be always, even now. However, afterwards, in 1995, and i don't know why, i felt some distance from him and his students towards me. Each of us stayed apart, as Lee was always in a group with his students, which was totally normal. But this distance took such a proportion that one day, in 1996, at the beginning of a darshan, our Father asked us to come to Him and told us : "Go and sit there, and speak together, of anything, but speak! ", and, during the days when Lee was there, He always put us together during darshans, and this every year. So, you can see how much He wanted us to work parallel. It is true that, in 1995, Yogiji always took this Krishna by His side, everyday, at every darshan. So, is it for this that this behavior appeared? So, now, i understand better why they were so distant (smile). But i could not understand this hatred because Yogiji loved me! Only the opposite could be understandable. Do you think that the Sun makes a difference and does not send his rays in the same way for everyone? Yogiji loved everybody! He was Love! I was not fighting, never, i even never thought of doing so i just received blows in the back, never directly and i didn't know. Why to fight? This, i don't understand. But now, what i wish is just to correct what is wrong. Krishna doesn't matter, Yogi Ramsuratkumar's Name matters! who got darshan of Yogiji in 1990 and received His blessing at Sannadhi street house) and me did our best to receive him the best way we could. And, to show that we had to work together, i even meet him in Paris some days later, telling him the same. But, afterwards, I did not get any news from him. I just met him in Tiruvannamalai every year at Jayanti time. Some years later, again at Yogiji's request, Lee visited me in Mauritius. This Krishna did his best to receive him in the best way he could. He brought good musicians from Chitrakut and organized a Ramnam Puja in his small house. Tulsidas Ramcharitmanas was chanted and, during the arti, Yogi Ramsuratkumar's name. Then, I brought him to some temple and asked him to deliver a speech there. There also, I told him that we had to stay in touch and work together. Once again, good resolutions were taken, but they have never been implemented. By the way, this puja and Ramcharitmanas chanting were recorded and I sent a copy of the video recording to Bhagavan, to show him that we were together, Lee and me. I was told that Yogiji watched the entire tape. I am sure that Lee does a good job. He is doing 'Father's work'. Does he not spread Yogiji's name? Did he not release a book such as 'Under the Punnai Tree', following Yogiji's instructions, even when he uses any book for projecting himself in an increcible way? As Yogiji said : 'The messager is not important, the message is important.' Is it not like this that the Vedas are still preserved, even if nobody understands them nowadays? So, Yogiji's name is spread .... Legends will disappear, the only truth will remain. and you cannot say that Yogiji does not find the instruments fitted to the time and the location. As for me, i think that the first reason of that distance between us was due to this American individualism. This is not at all personal to Lee, but to Americans in general (please note that there are wonderful exceptions, obviously (Hilda, Will, Bret, for instance). And, also, there is that American pride that makes them think that they are the best, that they know everything, and that other people are second class citizens. This has always hurt me, and i saw this individualism in Tiruvannamalai, where Lee's American students, and himself, were always moving in a group, always together, never mixing with Indians or other people, and looking at Indians as second class people and servants. but this is true for most of Western countries.... And see, nowadays you can find a lot of so-called gurus everywhere, and they even project themselves as 'Sad-gurus', let us not forget that this is Kali yuga ... You will always find people to follow... I remember another American girl who came to Tiruvannamalai in 1997, giving darshans. Funny, isn't it? Americans coming to India to give darshans (laughter). She was a Papaji's (Punjaji) disciple, and she thought she was 'realised'. Please consider this sentence : 'she thought she was realized" (smile). You know, what they have got is just some sudden intellectual understanding, but this has to do with the mind, not with the Atman. When she came at a darshan, Yogiji asked her to come by His side on the platform and was very kind to her. Then, suddenly, he called me and asked me to talk with her after the darshan session... For sure she was shocked! This little guy had to speak to her, to such a realized soul! Nice people, somehow deluding themselves, but nice people. But ok again, everybody is free to think whatever he wants. They think they are realised, it's OK. They create a legend about themselves, it's ok. They get fame and money, it's ok. Spirituality has become a big market nowadays, a global market (laughter), so you will always find naive people to follow them and sing their glory. You find Evangelist speakers who got some fame with many followers, and you find others who use something else. It has always been the same. Remember, one hundred years ago, Swami Vivekananda - the wisdom - on one side, and the Theosophists on the other side (basically American and using Hindu tradition), their fight to be known and the way they behave against him. So, there is nothing new under the Sun, everything is ok. Everything is in order. One day, i came to learn that M., an American student of Lee, had left his 'master', so much he was disgusted. 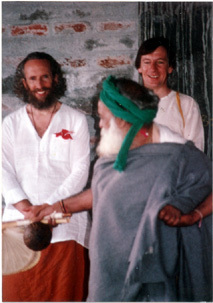 M. has lived in Tiruvannamalai for some time, he was there for Lee's interests. There he got almost daily darshan of Yogiji. Later he moved to France and tried his best to spread Yogiji's name. It is at that time that he left Lee. His master did everything afterwards for denigrating him. I could not believe it. This is what he tells me once again (nov. 2006) : "It was only a handful of years ago when I decided to leave Lee as my teacher and fully accept Bghwan as my master. One of the reasons I decided to do this is because of some of these actions that Lee does and always has done. When I took this act to leave him, being a double scorpio that he is and not a master like he thinks he is, he did everything in his power to stop me from going around France working with people and bringing them to Yogi. As you know this brought much heart pain number 1, then anger and tension. As I traveled around, I spoke of all this injustice to different people. " ). I asked him if it was true that Lee said about me was true. He confirmed and also told me that Lee hated me. I asked him why, and his answer was the same as M.'s answer : "So simple, Krishna, because Yogiji loved you so much! I have never seen any foreigner loved by Yogiji the way he loved you!' - "But Yogiji loved everybody!" So. B. told me exactly the same as M.
. I think I do now, after this last trip. Lee was the only child of a Russian Jewish family, and he was brought up in USA. This is a 'must'. Everybody knows that any "only child" doesn't know what brotherhood is, because he never had any brother neither any sister. These children are alone and are seen as kings by their parents. So, they grow with the feeling that they are better than the others, that they are leaders, whatever. This is not at all their fault. It is like this, and it must be very difficult to get rid of this, to free oneself from this. In Mani's book too, when he and myself were so close, Krishna has nearly disappeared and he is just a 'Frenchman visiting'... What is funny is that, in the book "Under the Punnai Tree", published by Hohm Press too (meaning Lee's Press), we find exactly the same in the mouth of Balaram when he narrates (in 2003) an episode of 1993 : "a man visiting from France". It is absolutely funny! Really funny! Lee has always done this, putting down people that could put him a little bit in shade. When you know that Yogiji was waiting for me, asking about my coming for days, you feel that this is a really very strange behaviour.... There is also the episode of the videotape he has released, it is the same. Now, one is led to understand this: In the same way he was the 'only son' at home, Lee wants to be seen as the 'only son" of Yogi Ramsuratkumar in the West. He wants to project himself as so. He wants people to believe that he is His only son, his only true Western disciple, that he only can speak in His name, etc. etc. He wants to be recognized as such. For this he does everything, never directly. M. was spreading Yogiji's name in France, therefore M. had to be crushed. O. did not want a chapter to be added in her book, aiming at the same goal, then O. had to be crushed. Krishna had to be crushed first, because he was the most embarrassing people. So, he was fouled. When they released that videotape on Yogiji, they did everything possible to remove Krishna from the tape. It was difficult, as at that time Yogiji took me continuously by His side. For sure i don't care, only Yogiji had to appear on the tape, even if, actually, it is not so (smile). And all this in spite of Yogiji asking twice Lee to visit Krishna, even in the far Mauritius!!! Then, not so long ago, Lee went on saying another lie, saying that Yogiji did not want any web site on Him, when i created the first website when He was still among us and when i received His blessings. Was it for making Krishna appear as wrong to people? What i said on the web was a organic reaction after this last lie. Too much was too much. You know, the beginning of Bhagavad Gita teaches us to fight against adharma, even if it appears in our own family. So, i did not fight against anybody, i fought against adharma, let us be clear on this. So, i just ask Lee this today: please, brother, stop this game. Our Master was the embodiment of humility. Learn some please. You are not the only son. They are plenty. Let each of them do his work and spread Yogiji's name and glory. You have to remove this idea from your mind, you have to free yourself from this idea. You have to go beyond. You have brothers and sisters, you are no more alone, you have to learn how to play with them, to accept them as your equals, to respect them. You are one of them. We might be happy to find others spreading our Master's Nama! Brother, be happy for this, help them instead of fighting them by giving them names, and you will find what is called Love. Yogiji wanted us to be in good terms. He said that we are doing Father's work. He sent you twice to me; do you think it was for nothing? Brother, free your mind, go beyond it, or at least try to do so. True spirituality begins only when one has cut one's head. There, you will find "unity, harmony". There you will find that "nothing is separated, nothing isolated." Brother, let us work in harmony. As our Father said : "The messengers are not important, the message is important." Messengers are just instruments. It's ok if you get fame in being an instrument for bringing people, at the level they are, to look deeper in themselves. Simply, don't fight against your brothers in this Western way of trying to put down some 'concurrence', because for these brothers of yours, there is no 'concurrence'. There is only Yogi Ramsuratkumar. Let us be all together, and this togetherness is within you, in the same way we could see in the pictures you sent me in 1995. Q. : Is it true that Bhagavan said once that Lee was an Indian saint?